Chipotle Mexican Grill is known for their tasty Tex-Mex food. Guacamole is a staple of Tex-Mex food, you can enjoy their guacamole anytime. You can get more Chipotle Mexican Grill Recipes here at CopyKat.com, the internet’s home of the best free copycat recipes. 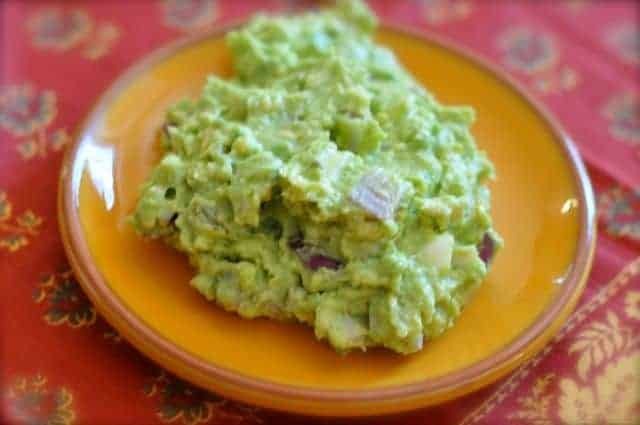 Make Guacamole just like Chipotle does with this copycat recipe. Wash avocados. Cut in half and scoop out the meat into a large bowl. Partially mash the avocados. Add onion, jalapenos, garlic and lime juice. Mash together until well blended and fairly creamy in consistency. Salt to taste. It’s amazing how wrong you all are… Here is the real recipe from the makers themselves. Mash avocados almost entirely. Stir in remaining ingredients. That’s it. use to be a manager there and will never forget that recipe. if you want to know anything else, feel free to ask. I love the corn salsa, do you have tips on that one? how do i make the medium salsa and the chips? No mention about tomatoes, are there none? What about bacon? The menu says it may contain bacon..
how do i make the guac. into more portioned controlled dip?There is only 2 ppl in my house that would be eating this so how do i make the recipe fit for 2 ppl and not 200? The portion controlled and updated version is in my book, CopyKat.com’s Dining Out in the home. I make this all the time. dead ringer for the chopotle recipe. correction.. 1/4 of a red onion. I think chopped that ends up being less than 1/2 cup. You might want to change that to be 2-4 Avacados instead of 24 Avacados. That’s a large volume recipe. 24 is correct.